David F. Ford of the University of Cambridge will present two public lectures as Candler School of Theology's distinguished visiting professor in the Alonzo L. McDonald Family Chair on the Life and Teachings of Jesus and Their Impact on Culture. Emory’s Candler School of Theology welcomes David F. Ford as the 2018 distinguished visiting professor in the Alonzo L. McDonald Family Chair on the Life and Teachings of Jesus and Their Impact on Culture. Ford is Regius Professor of Divinity Emeritus at the University of Cambridge. As holder of the McDonald Chair, Ford will give two public lectures, the first on “Jesus in the 21st Century” on Wednesday, April 11, and the second on “Reconciliation in the 21st Century” on Wednesday, April 18. The lectures are free and open to the public, but registration is required. A boxed lunch will be provided for all who register by the deadlines listed below. The April 18 lecture also will be available to access remotely as a webinar sponsored by Candler's Office of Development and Alumni Relations. A webinar registration link is below. Jesus is central to the world’s largest religion today, and the Gospel of John has arguably been the testimony to Jesus that has had most influence on Christian thought. This lecture will explore how the Gospel of John’s account of Jesus should be understood in the 21st century. Christianity is a religion of reconciliation in a world of multiple divisions and conflicts. This lecture explores how reconciliation should be understood and pursued by Christians today, paying special attention to differences between religions and religious-secular engagement. Those unable to attend the April 18 lecture in person are invited to register to view it as an interactive webinar. Born in Dublin and an Irish citizen, Ford read classics at Trinity College Dublin, and then theology and religious studies at Cambridge, Yale and Tübingen. 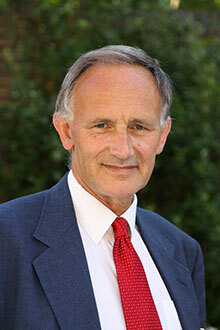 He taught at the University of Birmingham from 1976 to 1991 before joining the faculty at Cambridge. He was the founding director of the Cambridge Inter-faith Programme from 1992 to 2015, and a co-founder of the interfaith Society for Scriptural Reasoning. He chairs or co-chairs several interfaith initiatives focused on engagement, reconciliation and leadership training. Of the more than a dozen books Ford has authored or edited, several are in their second and third editions. In 2013, he was named an Honorary Officer of the Order of the British Empire, for services to theological scholarship and interfaith relations. Recipients are given a distinguished visiting professorship, in which they speak and teach in the focused area of Jesus’s effect on culture and conversely, culture’s shaping of the figure of Jesus. Past McDonald chair lecturers include Judge John T. Noonan of the U.S. Court of Appeals for the Ninth Circuit; composer Alice Parker; art historian Herbert Kessler; historian and documentary filmmaker Randall Balmer; author James Carroll; Episcopal priest and bestselling author Barbara Brown Taylor; Pulitzer Prize-winning author and historian Garry Wills; Jesuit priest and film professor Lloyd Baugh; and scholar David H. Kelsey, among others.